Interested in being sedated? Make sure your dentist has this license! Earning a license to provide IV sedation to patients in a dental office is not an easy process. Nor should it be. While moderate or twilight sedation avoids the majority of the risks of general anesthesia, it can still result in significant complications if the person administering it is not properly trained. Dr. Nick Calcaterra is one of only an elite few general dentists in all of Connecticut who holds a certificate to administer IV sedation. 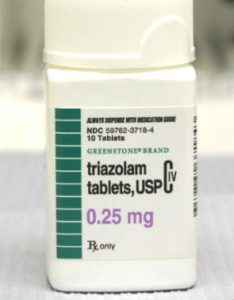 This enables him to perform IV and/or oral sedation on patients in his office – a procedure he does on a routine basis. It also ensures that you – the public – are being sedated by an individual who has the skills needed to do it safely. We get sedation-related inquires all the time. Many patients want to know why there are so few licensed sedation dentists in CT. Here, we outline some of the major steps and milestones needed in order to provide this service safely in a dental office in Connecticut. 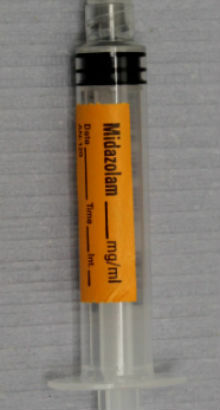 Extensive training and licensure is required to administer this IV med. To become eligible for licensure, the dentist must complete extensive additional training in anesthesia. This is not a weekend type class in a hotel conference room! This is nearly always done as part of a hospital based residency program. In Dr. Calcaterra’s case, he spent nearly two months (Saint Francis Hospital in Hartford and the University of Pittsburgh Medical Center facilities) working directly with anesthesia providers and completed well over one hundred cases with them. You can read more about the education guidelines here. The dentist must make significant investments in monitoring and safety equipment for his/her own office. This includes monitors for blood pressure, oxygen saturation, heart rate, end-tidal carbon dioxide, and an ECG. In addition, the office must have an AED, portable oxygen, airway support devices, equipment that will function in a power failure, and many other items. The dentist must be certified in Advanced Cardiac Life Support (ACLS) and his/her entire staff must be certified in Basic Life Support/CPR. Dr. Nick has maintained continuous certification in ACLS since graduating #1 in his class from dental school in 2009. The dentist must then undergo a site inspection by providers trained in Anesthesia to ensure that the provider, his/her facility, and staff are able to provide these services safely. Sounds like a lot, doesn’t it? It is. As it should be. But What About Oral Sedation? In most cases, you need a Sedation License to do Oral Sedation. Many dentists in Connecticut and elsewhere will advertise sedation dentistry but then practice oral sedation. Depending upon how each State’s laws are written, the oral route may be possible without a permit from the state. 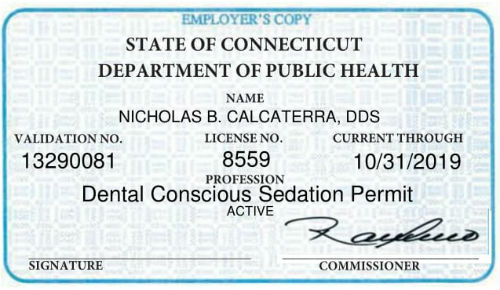 In Connecticut, if oral sedation reaches the point of being considered “twilight” or “moderate”, then a valid license is needed. See the end of this post for more details. We get many inquiries from patients asking us what makes our office different from other offices in Connecticut advertising sedation dentistry. It’s simple. And we’ve said it already. Dr. Nick Calcaterra is one of only a few general dentists in all of Connecticut who holds a valid license to perform twilight or moderate sedation in his office. 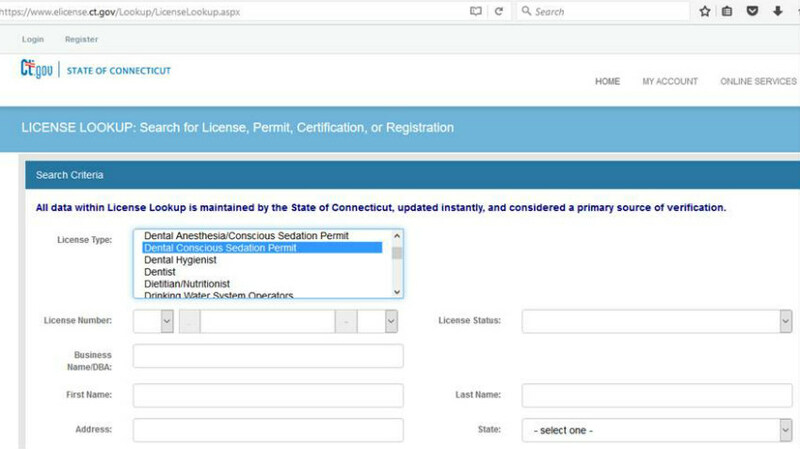 Without a license, you cannot perform moderate or conscious sedation in Connecticut, unless an outside anesthesia provider is being brought in to administer it. Want to see if your general dentist has the appropriate license? By highlighting Dental Conscious Sedation, you will see if your dentist has a permit. By doing this, you will see the names of all the dentist with conscious sedation permits. Note: “Dental Conscious Sedation Permit” is typically for general dentists and periodontists; “Dental Anesthesia/Conscious Sedation Permit” is typically for oral surgeons or dental anesthesiologists. An alternative approach is to put in your dentist’s name in and then search upon him/her. When the search results come back, check to see if he/she has a permit. It is our opinion that conscious sedation should only be performed by a practitioner holding a sedation permit. Therefore, we recommend that for those patients looking for a sedation dentist, they should ensure their dentist has a Conscious Sedation Permit in good standing as listed above. If he or she is not listed, then he/she has NOT met the rigorous requirements outlined above. Are you looking for a sedation dentist with experience administering hundreds of cases? A dentist who does this all the time, as opposed to one per month? If yes, call us (203) 799 – 2929 or visit this page to request a sedation consult with Dr. Nick Calcaterra. Note: the information on this page is our opinion and is based upon our own research and interpretation of the Connecticut Dental Practice Act. Sedation and anesthesia are specifically discussed on page 6 and 7 of the Act. Always do your own research as you select your health care providers.